Signed as a free agent on January 20, 2015. 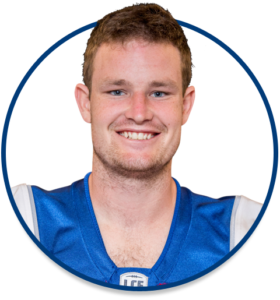 2016: Played in all 18 regular season games at quarterback for the Tiger-Cats…Completed 18 of 29 pass attempts (62.1%) for 201 yards with one touchdown and one interception…Added 16 carries for 26 yards and three touchdowns. PLAYOFFS: Dressed in the Eastern Semi-Final on November 13 vs. Edmonton. 2015: Signed with the Tiger-Cats on January 20 and dressed in 17 regular season games, making five starts, in his rookie CFL season with the Tiger-Cats…Completed 118 of 177 passes for 1,458 yards and six touchdowns…Added 34 carries for 96 rushing yards and led the Tiger-Cats with six rushing touchdowns…Made CFL debut June 26 at Calgary…Scored first CFL touchdown (rushing) July 2 at Winnipeg…Made first-career CFL start October 2 vs. Calgary…Threw first-three touchdown passes and completed 22 of 33 pass attempts for 385 yards on October 9 vs. Saskatchewan, earning Shaw CFL Top Performer of the Week honours (2nd place)…His third touchdown was the CFL’s longest play from scrimmage in 2015, connecting with Terrell Sinkfield Jr. for an 87-yard completion…Left game November 1 vs. Ottawa due to injury, and missed remainder of the regular season and playoffs. 2014: Signed as an undrafted free agent by the NFL’s Atlanta Falcons on May 11…Released by the team on August 24…Signed as a free agent to the Indianapolis Colts practice roster on August 31…Released by the team on September 9…Signed as free agent to the Arizona Cardinals practice roster on December 15. College: Played 38 games in four seasons (2010-13) at Cornell University…Finished his NCAA career as the most prolific passer in Ivy League history, completing 901 of 1,447 passing attempts for 11,284 passing yards and 72 touchdowns with the Big Red….Added 564 rushing yards and nine touchdowns…Led the Ivy League in completions (228), attempts (360, passing yards (2,953), passing yards and total offensive yards (2,935), passing yards per game (328.1) and ranked second in passing touchdowns (22) as a senior…Ranks among the top 20 all-time in career passing yards in the FCS, and set a new Ivy League passing record by more than 2,000 yards…Ended his career with 47 Big Red school records and 18 Ivy League marks for passing and total offence…Was a three-time All-Ivy selection and a Capital One Academic All-District first-team selection as a senior…Was a unanimous choice for Ivy League Rookie of the Year in 2010 and was the first sophomore in Ivy League history to be awarded the Bushnell Cup in 2011. Personal: Born on August 25, 1991 to Jeffrey and Shellie Mathews…Attended Camarillo High School, where he was named league MVP in 2009…Studied at the College of Arts and sciences at Cornell.